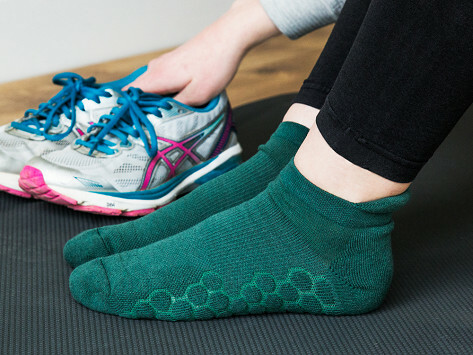 Pull on a pair of anti-odor socks that also fight fatigue and keep feet feeling fresh. Made from antibacterial material infused with zinc oxide, these breathable socks can be worn for a week without washing them. There are also built-in cushioned footpads to absorb impact, anti-blister tabs, and reinforced arch supports. Care: Turn socks inside out and machine wash on cold. Tumble dry at low heat or dry flat to prevent shrinkage. Dimensions: 9.45" x 5.31" x 0.39"
I hate socks; of any kind; but love these little socks. They are super comfortable; so I sent for two more pair! Works as promised. My adult son swears by them. Leo Chen set out to make his own perfect pair of anti-odor socks—that are also anti-blister and anti-fatigue, too—when serving in the Taiwanese Army. The military-issued boots he wore were beyond uncomfortable, and none of the socks he tried (30 different pairs!) met all his achy (and smelly) feet needs. NeverQuit socks combine all the feet-pleasing features Leo wanted. The socks provide extra support and extra comfort with hexagon-shaped footpads that absorb impact and reinforced arch supports that thwart fatigue. Mesh ventilation keeps things breathable, and there are anti-blister tabs built in, too. But maybe the most impressive thing about these socks is the zinc-oxide infused, antibacterial fabric they are made with. It prevents odor, so the socks can be worn for seven days without being washed—no, really, we mean it. Pull on a pair and feel fresh on your feet, all day (and week) long.